Wanted's Millar To Reboot Superman? Following on from the record-breaking opening this weekend, is Wanted creator Mark Millar about to get the chance to fulfill his dreams and revamp Superman "for the 21st century"? That seems to be what he's claiming, and not for the first time. Since I was a kid I've always wanted to reinvent Superman for the 21st century. I've been planning this my entire life. I've got my director and producer set up, and it'll be 2011. This is how far ahead you have to think. 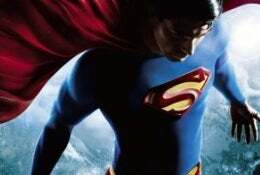 The Superman brand is toxic after that last movie lost $200million, but in 2011 we're hoping to restart it. Sadly I can't say who the director is, but we may make it official by Christmas. But fingers crossed it could work out, that would be my lifetime's dream. In the interests of clarity (because I'm sure this will be picked up somewhere) a very well known American action director heard about my love of Superman, approached my and asked me to team up with he and his producer to make a pitch for this. We've been talking for several weeks now and, if this is going to happen, we'll know by Christmas. He has huge pull at WB so fingers crossed. But this is nothing more than a huge US name pulling me into his fold and making me part of a package. It's 8.58am right now, my guys at CAA get into the office in about seven hours and my call will be waiting for them to talk about this. I want to revamp Superman like Hillary wants thin ankles. Revamping this franchise is what I as given fingers for and so, invited or not, I'm putting my plan together now. I've been asked to work on half a dozen screenplays lately, but this is the only one I have ever truly wanted. He didn't get the gig because, he explained, Warner Bros didn't want to hire a Marvel Comics-contracted writer for a DC Comics project. Which seemed somewhat strange considering Warner then hired fellow Marvel-exclusive writer Marc Guggenheim to write the Green Lantern movie less than a week later, but facts should never get in the way of a good story. I know Superman isn't an orphan in this dreadful period he's been under seige (from 1986 until Hitchy and I fix him again), but the true understanding of the character is, like Bambi, he loses his Mum and Dad again. All the iconic heroes do whether it's Superman, Bambi or Batman... Superman is God, Jor-El is the Holy Spirit and Clark Kent is Jesus. The Kents are Mary and Joseph and Lois is Mary Magdelene. Yeah, that's the kind of Superman movie that the world is waiting for alright.